The location was perfect. 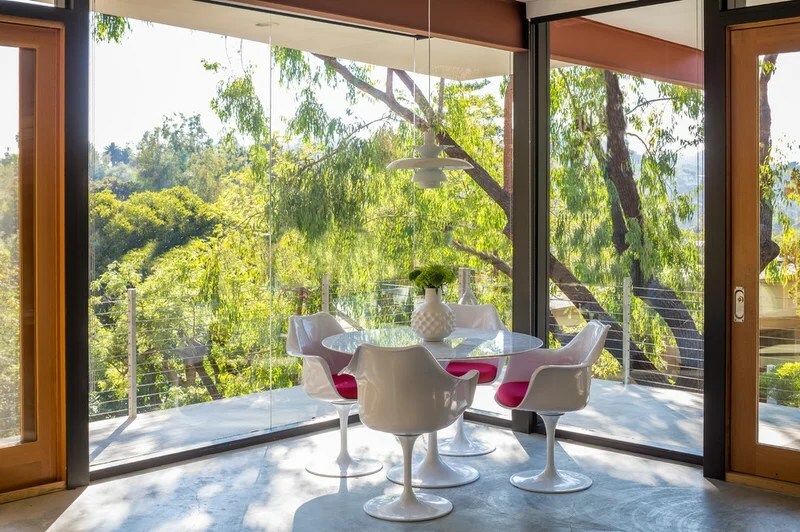 Nestled in the woods of Los Angeles, surrounded at night by deer and coyotes, with no neighbors to speak of, this 1950s Hollywood Hills abode was the perfect California hideaway. A five-minute drive put you on Hollywood Boulevard. 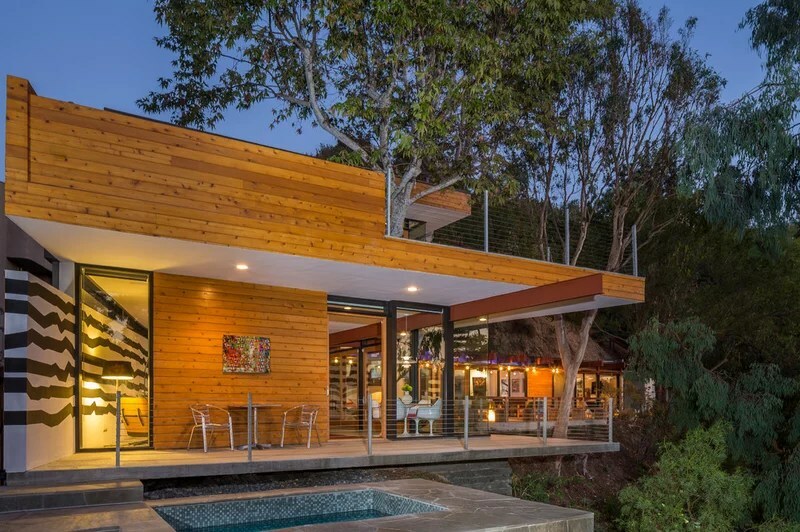 The western redcedar exterior looked like a cabin, but the midcentury layout felt fresh. Jack Latner had found the perfect house before he even stepped inside.In 2009, after a year of searching, Latner bought the 1950s Val Powelson home from its third owner. He was easily sold on the property; an 800-square-foot master bedroom addition that enclosed a decades-old California sycamore tree only sweetened the deal. “I thought it was one of the coolest things I’d ever seen,” he says. 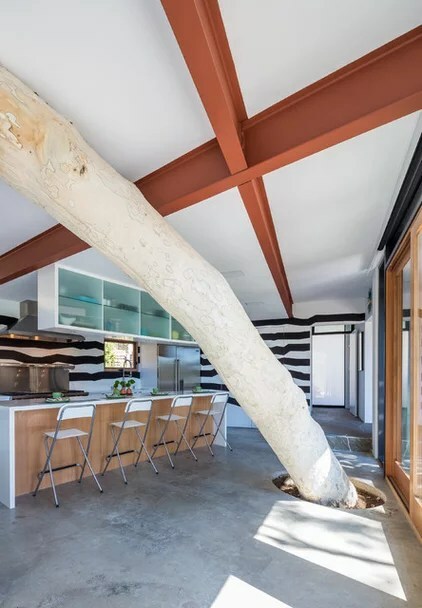 In aNew York Times article featuring the addition, the previous homeowner had said the tree had been there longer than both himself and the house, and for that reason it deserved to stay. 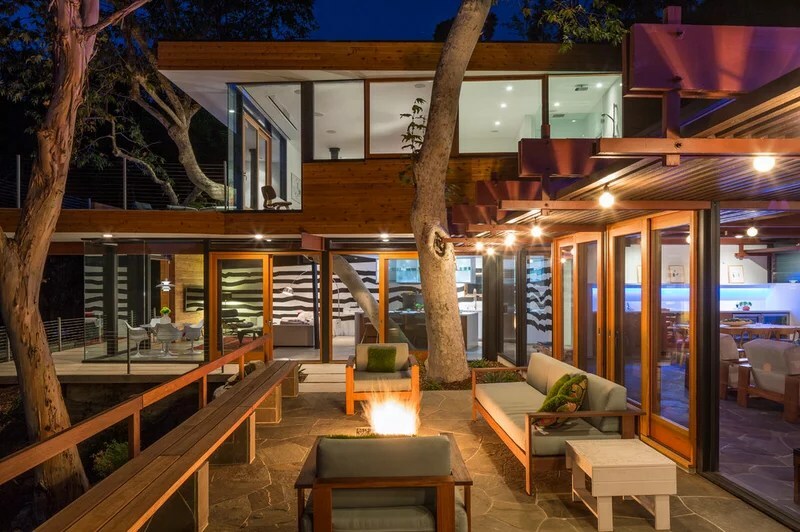 Latner, a California transplant, sees this as indoor-outdoor design at its finest. Most people are shocked when they see it, he says, then they ask if it’s real. Size: 1,300-square-foot original house; 800-square-foot first-floor addition; 700-square-foot second-floor addition. Year completed: The original house was built in 1957; the addition was built in 2008; the renovated was completed in 2013.Architect Aaron Neubert hired an arborist and a landscape designer to survey the tree’s health before he started building the addition for the previous homeowner in 2008. The California sycamore is a very forgiving tree, he says, and both professionals felt confident about building around it. The lush green canopy of the sycamore now extends through and above both floors of the addition. A custom fireplace is nestled between the original house (to the right here) and the new wing (in the background) on a new bluestone patio. Steel I-beams frame the sprawling trunk to create a perfect juxtaposition of nature and man-made detail. The tree does what it wants, says Neubert. “Every time I go, the tree is a little different,” he says. California sycamores are admired for their attractive, patchy bark and sweeping habit, and can reach heights of up to 75 feet.Latner lived in the house for about three years before he decided to renovate. 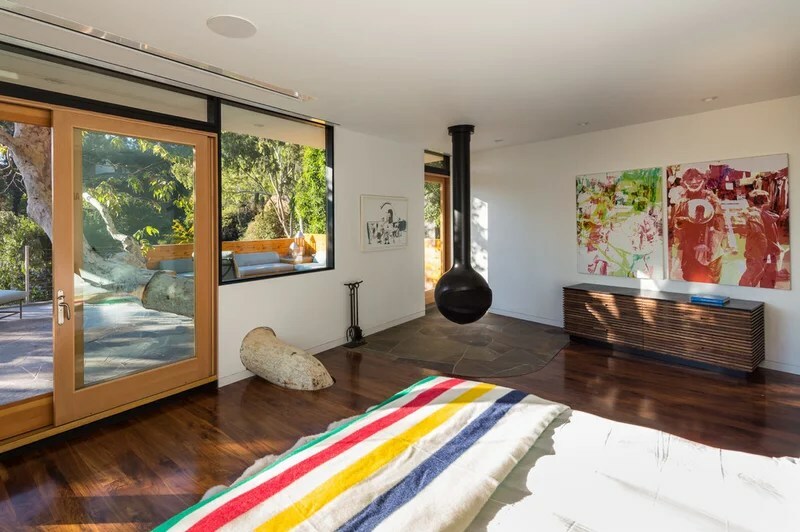 He tracked down Neubert and asked him to convert the then–master bedroom into a lounge area and open kitchen. A perpetual entertainer, Latner felt this space deserved to be experienced by guests, but he also wanted a more secluded master suite. “I share the rest of this house with the people I love and spend time with,” he says. “I needed to create a separation between the common area and my personal area.”Neubert felt a little conflicted about revising a home that had turned out so well, but was confident that the love Latner and his family had for the house would lead to another successful renovation. The room has some pretty irregular geometry to best take advantage of the site. From where it connects to the original living room, it flares out to its glassed western edge, and not many lines meet at 90-degree angles. 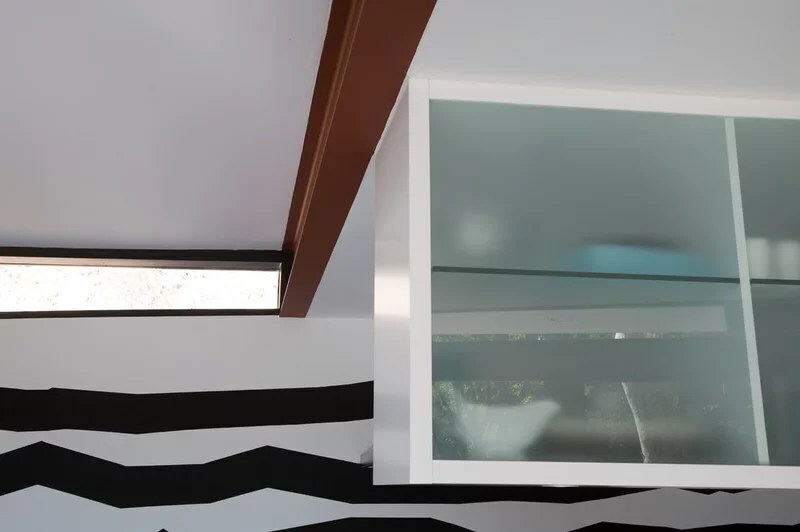 “There’s a high window that is not a right angle in any corner,” Latner says.Latner had tried to hang artworks on the walls before, but their dissonant angles always bothered him. “The space was calling for something that was different and conceptual,” he says. One day while sitting in one of his family’s homes, he noticed an irregular and geometric black and white Sol LeWitt wall drawing that he thought could work. 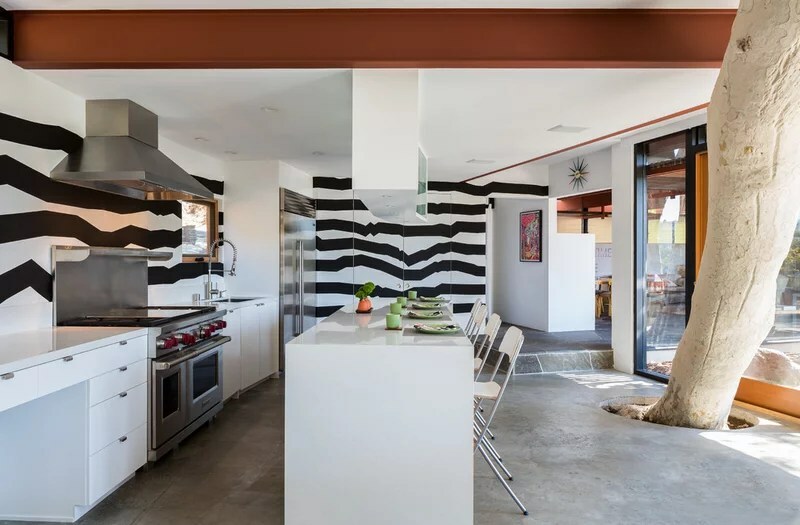 The home was slated to be torn down, and the drawing would need to be re-created.A local artist followed the late LeWitt’s guidelines for the drawing, accurately replicating the line width, patterns and spacing. Latner’s family bought the copyright to this piece after seeing it in a gallery exhibit and have exclusive rights to re-create it in private. If Latner ever moves, he’ll paint over it and re-create it somewhere else. A Sol LeWitt retrospective is on view at the Massachusetts Museum of Contemporary Artthrough 2033. Neubert and Latner also restored parts of the original house. At some point the living room’s beams had been painted white and bamboo floors had been laid. 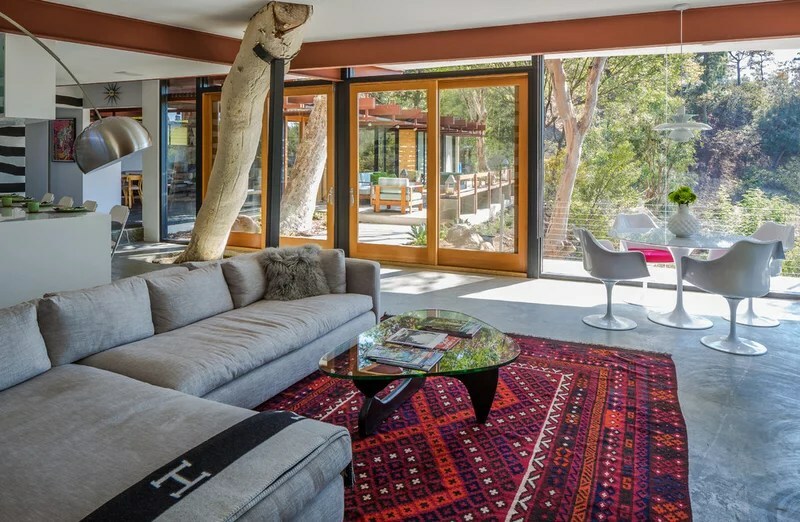 They refinished the beams and replaced the floors with bluestone pavers, inspired by John Lautner’sGoldstein Residence, which they also used outside.The home’s original galley kitchen had run along the living room’s far wall. Neubert pulled out the kitchen and put a single-walled wet bar in its place. They didn’t want to touch the original house too much, but also wanted to make this space feel as open as possible. The home still had its original aluminum doors, which they replaced with the same Douglas fir sliding doors that had been used in the addition. Lawrence Weiner wall art also came from Latner’s family. Back in the addition, Latner created a new lounge area. 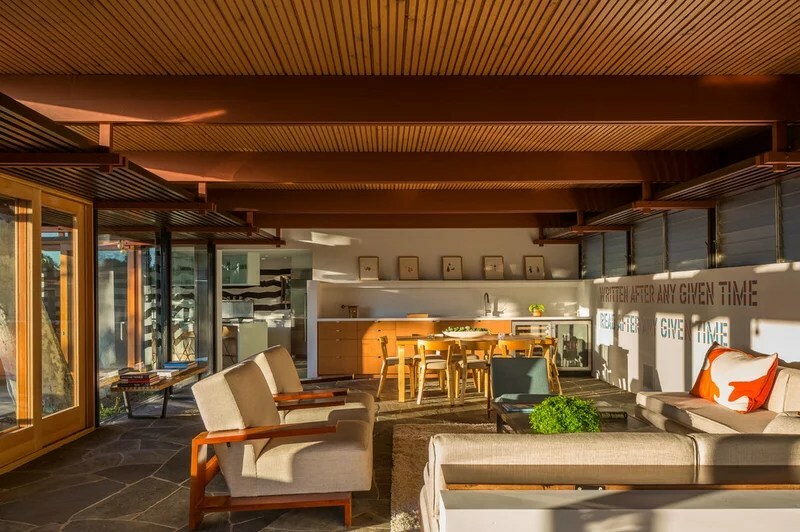 The openness of this living space ties back to the midcentury open plan.Steel I-beams on the home’s new side were designed to emulate the house’s original wood beams (seen in the background), without duplicating them. “It was more of a symbiotic relationship between the two, but using modern technology,” Neubert says. The new space and the old space create symmetry. Sliding Douglas fir doors and lots of glass honor the original home. “The air flows through the house so beautifully,” says Latner. Midcentury furniture also ties the two halves together. Secondhand, auction and original pieces appear throughout, but Latner isn’t afraid to admit that some reproductions are mixed in there too. “People spill drinks all the time,” he says. “I can’t watch people all the time if they don’t put a coaster down,” he says, and he doesn’t want to. Neubert and Latner added 700 square feet directly above the first-floor addition, including the master bedroom and bathroom and a closet. An additional 350-square-foot patio opens up off the bedroom.Latner considered building the master suite on the home’s other end, but thought twice about building a $200,000 retaining wall, in addition to considering other structural challenges. 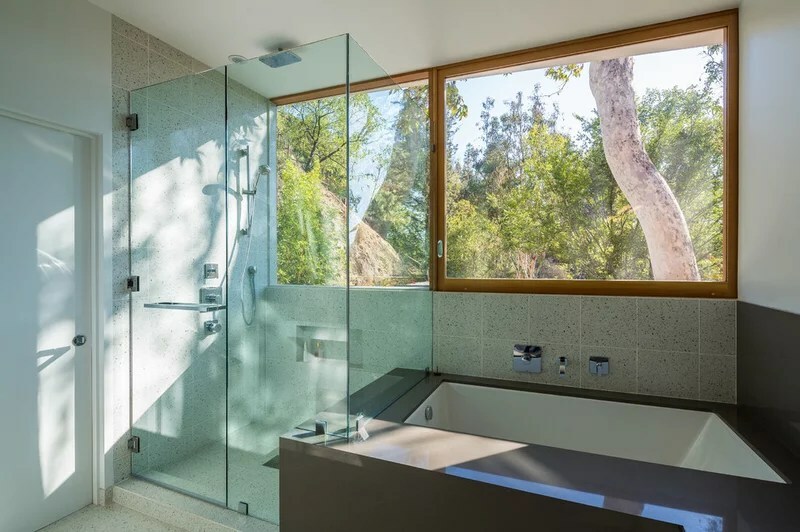 The first addition had also been engineered so that at least one more story could be added to it without touching the foundation.The upstairs master bathroom has counters and a tub deck surround made of quartz. 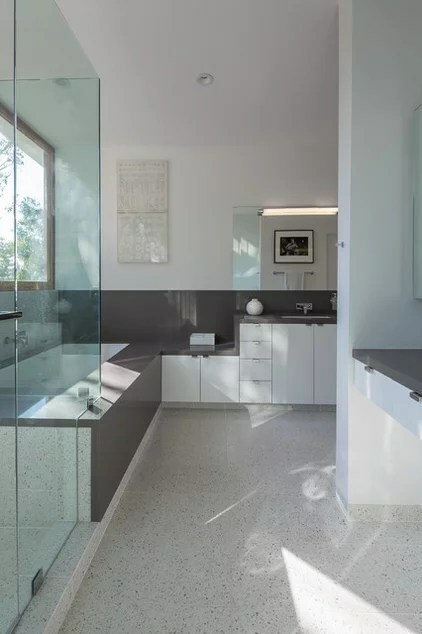 The floors are terrazzo tiles. A new structural engineer had to build the second story on top of a structure that had been engineered by someone else, trying to match the drawings with what was actually built, all while transferring the load back to the 35-foot foundation so no additional foundation or columns needed to be added. The team also had to fit in stairs and a new kitchen, bedroom and bathroom. 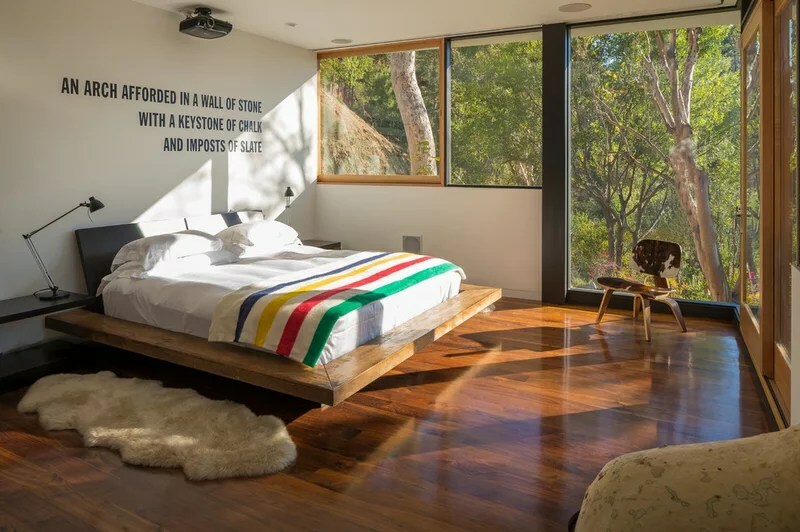 It was more like a puzzle, says Neubert, and even more challenging than building a room around a tree on a steep slope.Adding the bedroom above the lounge area involved revisiting the tree. The walnut floors’ structure is held away from the tree. Where the tree leaves the building, redundant flashing prevents water and air from entering. (The climate and an extended overhang make it an infrequent issue anyway.) Expandable foam gives the tree room to grow. Latner says the groaning and cracking of the tree swaying in the wind took some getting used to. An arborist visits once a year to check on the tree’s health, and so far it’s been getting good reports. Custom housing allows the tree to move and prevents bugs and moisture from getting in.Another piece by Lawrence Weiner accents the bedroom wall. Does your home feature an amazing tree? We’d love to see a photo in the Comments section below! The hanging fire orb was part of the first remodel. It was simply moved up one story. A concealed projector screen gives Latner a big screen without blocking his view.The two art pieces are by Parvez Taj, a friend of Latner’s. These came from his first collection several years ago and are digitally manipulated photographs printed on canvas.